Is Gamer A Dirty Word? In today's Speak-Up on Kotaku, commenter EcksJay22 explores the negative connotations video game enthusiasts give to the word most often used to describe them. 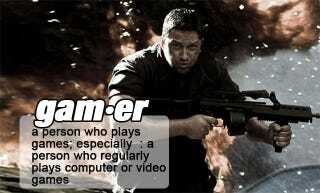 I hate the word "gamer." I really got to thinking about that term, as opposed to parallel ones I could come up with like, say, movie buff. The difference seems to be a subtle one but I think it's this: we look at a gamer as someone who is at least in some sense defined by their relation to the medium, where a movie or art buff is someone who merely thoroughly enjoys their hobby. Maybe I'm alone in feeling that there's a distinction, but it's something I've noticed over time and wanted to try and put my finger on. It was recently said to me (in a valid point, mind you), "is that the perception of gamers that you want out there?" I was struck by this sentence. Why are gamers the only ones who are defined in lieu of the medium they enjoy? Movie- or art-ophiles need not worry about the presence of those who casually enjoy what they love affecting their definition of themselves, so why gamers? Obviously there's a societal stigma and constant judgment as the medium continues to grow that doesn't exist with other, more established ones. As with anything in its (relative) infancy stages, there's an element of identity establishment, sure, but there is an exclusionary elitism with gamers that doesn't help matters. We should welcome anyone who enjoys our medium, it only serves to grow it into whatever it is to become. Rather than be angry at a solitaire or Farmville player, be happy someone enjoys a game, regardless of how far into the hobby they delve. Much as movie buffs and people who casually watch movies coexist, gamers and those who casually enjoy games should as well- not as opposing entities, but as soldiers (albeit of different rank) in the same army.